Consumer attitudes toward genetically modified food improved by 19% after mandatory labeling in Vermont, compared to the rest of the U.S.
As national regulators work to develop mandatory GMO food labels, new research by UVM's Jane Kolodinsky finds that consumer opposition to GMOs dropped significantly after Vermont adopted mandatory labels. "Our findings put to bed the idea that GMO labels will be seen as a warning label." 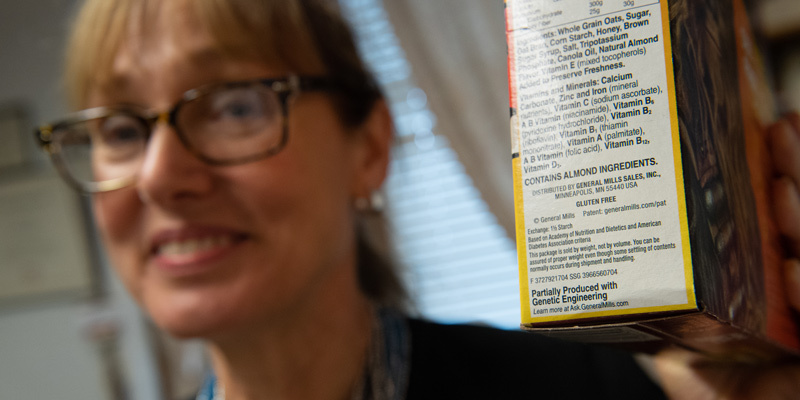 New research from UVM's Jane Kolodinsky finds that a simple disclosure label indicating that a product contains genetically modified ingredients can improve consumer attitudes toward GMO food. As the U.S. Department of Agriculture prepares guidelines for labeling products that contain genetically modified ingredients, a new study from the University of Vermont reveals that a simple disclosure can improve consumer attitudes toward GMO food. Led by Jane Kolodinsky, an applied economist in UVM’s College of Agriculture and Life Sciences, the study compared levels of consumer opposition to GMO foods in Vermont – the only U.S. state to have implemented a mandatory labeling policy – with consumer attitudes in the rest of the U.S. The analysis showed opposition to GMO food fell by 19% in Vermont after the implementation of mandatory labels. The study is the first to examine the real-world impact of consumer attitudes toward GMO foods in a state where consumers were exposed to mandatory GMO labels. Published today in Science Advances, the research provides timely new evidence in a longstanding national debate over the impact of mandatory GMO labeling policies on consumer attitudes. Several studies, including past research by Kolodinsky, show consumers consistently express a desire for labels on GMO foods, but mandatory labeling has been opposed by some manufacturers and scientific organizations for fear that the labels would be perceived as warning signs and might signal that a product is unsafe or harmful to the environment. Despite numerous scientific studies that have shown that GMO foods are safe, nationwide, the majority of consumers express opposition to the use of GMO technologies, a trend that has been steadily increasing over the past decade. “We’re finding that both in real-world and hypothetical studies, the introduction of a simple disclosure label can actually improve consumer attitudes toward these technologies. In a state that has been such a hot bed for GMO opposition, to see this change is striking,” said Kolodinsky, who has tracked attitudes to GMOs in Vermont since 2003. Kolodinsky’s latest study, with co-author Jayson Lusk of Purdue University’s Department of Agricultural Economics, suggests a simple, straightforward label disclosing whether a product is “produced or partially produced using GMO ingredients” may improve consumer confidence in GMO technologies and enable consumers to make an informed decision. However, proposed national labeling regulations released by the U.S. Department of Agriculture in May, seek a narrower definition of genetic engineering and propose alternatives to simple labeling disclosures. The draft guidelines also propose changing the labeling terminology from GMO to “bioengineered” or “BE”, a new descriptor for genetic engineering that is unfamiliar to most of the general public. The USDA has invited public comments on the draft guidance through July 3, 2018. 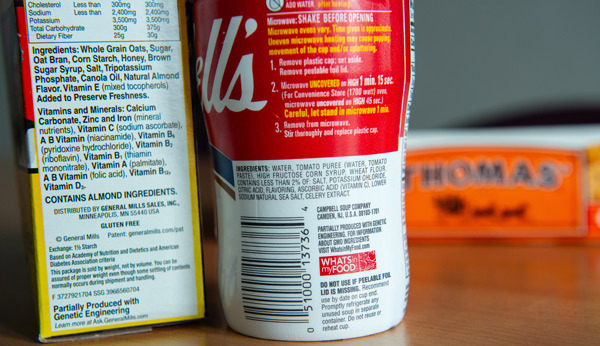 While several states introduced bills to require labeling of GMO foods, Vermont became the first and only U.S. state to implement a mandatory labeling initiative in July 2016 before the new federal legislation came into effect. Kolodinsky, who collected data on Vermonters’ attitudes toward GMO food before and after the labeling policy was implemented, combined her results with Lusk’s national data. Taken together, the study analyzed attitudes of over 7,800 consumers from 2014-2017 who ranked their attitude toward GMO food using a one to five scale. When controlling for demographic factors, opposition to genetic engineering fell significantly in Vermont after mandatory labeling, whereas opposition continued to increase nationwide. “One of the concerns many people, including myself, expressed about mandating GMO labels is that consumers might see the label as a type of warning signal and increase aversion to the label. This research shows that this particular concern about mandatory GMO labels is likely misplaced,” said co-author Lusk. Kolodinsky and Lusk note the findings are consistent with prior research that suggest “labels give consumers a sense of control, which has been shown to be related to risk perception.” Indeed, some food manufacturers, including General Mills and Campbells, continue to voluntarily label GMO food products citing consumer demand for transparency. Funding support for the research came from the USDA’s National Institute of Food and Agriculture and the Willard Sparks Chair at Oklahoma State University.